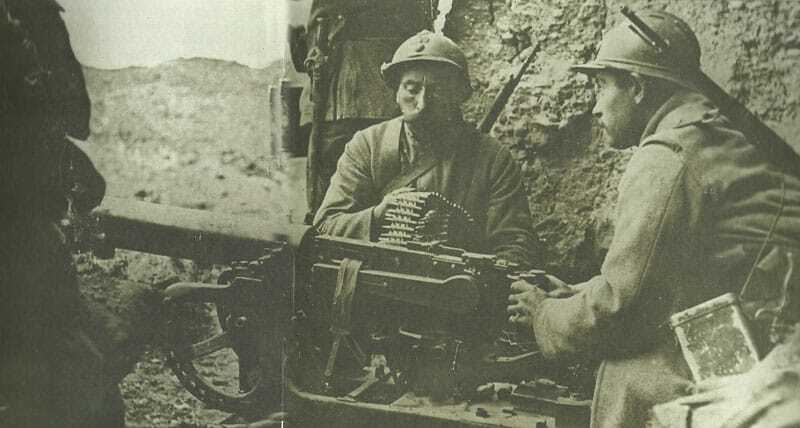 French soldiers man a German machine gun amid the ruins of the recaptured Fort Douamont at Verdun. Verdun – First French Offensive Battle of Verdun (until December 18): Nivelle and Mangin send 3 picked and compass-guided divisions (29 battalions) to assault 7 tired and depleted German divisions (only 16 battalions in front line) through mist, reoccupy Fort Douaumont and capture 6,000 PoWs. May positions regained. Rumania: Falkenhayn south of Torzburg Pass and fighting near Kimpulung. Dobruja: ­Mackensen reaches Mejidia on Danube-Black Sea railway, occupies Cernavoda on Danube after Rumanians blow bridge on October 25. Arabia: Lawrence first meets Feisal at Hamra, decides he is the potential leader. HMS Hardinge arrives at Rabegh with Egyptian mountain guns from Jeddah.